All shelf materials are machined to accept formed aluminum extrusions shaped to fit into a routed slot on the end of the shelf and to rest on the shelf support pins. 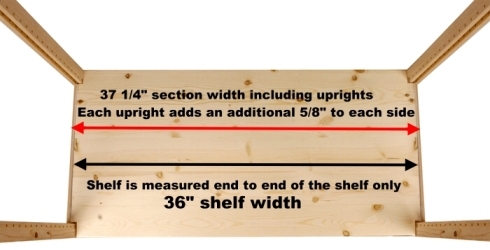 Typical shelving sizes are 12"deep x 36”, 42” or 48"wide unless noted otherwise. 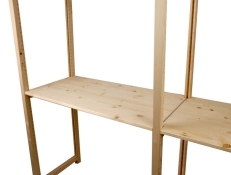 Shelves can be sanded smooth unfinished or finished with clear protective lacquer. Uprights are manufactured from mostly clear, solid hemlock or Douglas fir. Two 1-5/16" x 1-5/8" stiles are to have a 3/8" wide x 5/8" deep plow the entire height to receive shelf end channels and are drilled with 3/16" diameter holes on 1" centers to allow for shelf adjustability. Stiles are locked together with two or more cross members mortised into the stiles. All components are machined smooth with all outside corners eased. 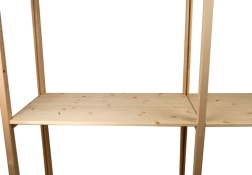 Uprights are available unfinished sanded smooth or finished with clear protective lacquer. Connectors are available either using our X-braces or Freestanding Kits. Our X-braces are available in galvanized metal finish or painted almond color. Our Freestanding Kits are available standard for 24", 30", 36", 42" and 48" widths. See our parts section for more details and assembly instructions. Whenever you have two or more sections side by side you will only need one standard upright between the sections. 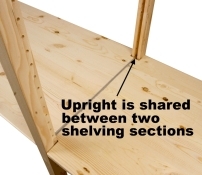 Our uprights are designed to be shared between shelving sections as noted in the above photos. Shelving widths are measured end to end. When placed inside two uprights the overall shelving section dimension will grow by approximately 5/8" on each side inserted into an upright. 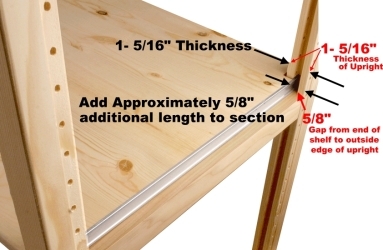 Therefore a 36" shelf can end up being 37 1/4"wide including the thickness of two uprights. 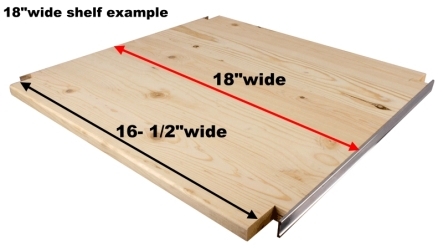 When sharing uprights to create side by side units, add approximately 5/8" to the length to get your overall dimension.